When I walk along the streets in Paris, I inevitably find myself being irresistibly drawn inside by the display of rows of beautiful cakes in the windows of the Patisseries (cake shops). In 1890 in the Banking District, near the Bourse, (the French Stock Market) Monsieur Lasne, a creative baker, started making gold ingot shaped small cakes, using mainly egg whites, almond powder, sugar and butter. He called these cakes Financiers (after the Bankers who liked to have small cakes on their way to work). They became very popular and subsequently many different variations on his basic recipe were created. 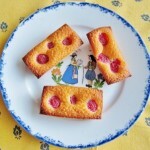 One of my favourites are the Financiers with fresh raspberries. 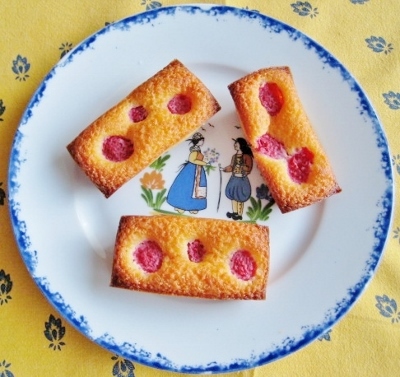 These little golden, oblong shaped cakes are really easy to make and very light. The fresh taste of the raspberries balances the richness of the butter and the lovely flavour of almonds and vanilla. When I make a batch I find that they disappear almost as soon as they come out of the oven. They can be served as a desert or as a snack and they go beautifully with a small glass of iced Eau-de-Vie de Framboise (wild raspberry schnapps) from Massenez. Fill oblong molds to about 3/4 way up.